Popularity. If there's ever been a term that should be tough to quantify, it's popularity. But in today's world, people have not only figured out a way to quantify popularity, but many more have made a living monetizing it. The sports card landscape is a perfect example, and this list is a popularity contest of the greatest Hall of Famer football cards in history. The list hasn't actually changed that much over the last 15 years, despite the excess production of cards in the 80's and 90's. We used Ebay action listings November 2012-January 2013 to give a rough gauge of popularity, as noted below, but it was not the only measure by any means. Always understated, Barry Sanders was the model of consistency on the field and has remained so in the market despite the mass production of his rookie card. With over 300 sold listings on Ebay during the 3-month sample period listed above shows that collectors haven't forgotte n how amazing Sanders feats were on the gridiron. Marino probably won't last on this list once players like Favre, Manning and Brady are enshrined, but for now he still remains in the top 10. Although higher production numbers (and maybe a few fakes) push his number to over 600 sold during the sample window, Marino's quick release and staggering numbers are still fresh in the mind of collectors. Johnny U's popularity has stood the long test of time, and his RC popularity is a testament to just how special a player and icon he has been for the game of football. While he had under 100 sold listings in the sample, we have used the 'printing presses curve' to reserve a spot for him in the top 10. Nearly any vintage dealer will tell you that Unitas is always in high demand. 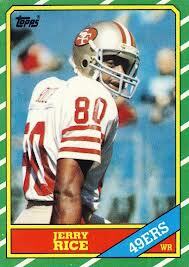 Some say Rice is the best PLAYER in NFL history, but his rookie card has always been a strange one. Without his presence in the 1986 Topps production, the set may have been written off almost as quickly as Max Hedroom was in the 80's. But Rice has kept it at the top of everyone's mind in the market, since he sits atop nearly every record feasible for a wide receiver. With over 300 sold listings, he continues to a hotly traded hall of famer. 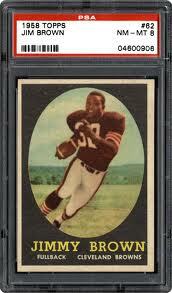 Similar to Unitas, Jim Brown's legendary status has endured into the contemporary game of today. His toughness and prowess has kept his rookie card on many people's lists, and while under 100 sold listings don't allow him to compete with cards that are mass produced, he will remain on this list for a long time to come. When you talk popularity contests, there's no question that a guy with the nickname 'Broadway Joe' is going to make it. With 99 sold listings, he's still a fan favorite, despite his efforts over the past few years that may have caused some people to lose interest. His contract with the Jets was part of a transformational time in the league, and we can 'guarantee' he'll be atop many lists in the hobby for quite some time. Whether Joe is the greatest QB of all-time or not is always debatable, but there was a time when his RC failed to gain too much traction even as he went into retirement. But over the last 15 years he has leapfrogged many others, and with just over 600 sold listings it's clear he is always in the discussion for nearly every 'top' list of any kind in relation to the NFL. Gone but not forgotten. The entire country seemed to embrace the 1985 Bears Super Bowl team, and Walter Payton as the workhorse of the squad. Since those days, his RC has always been heavily traded and with nearly 250 sold listings, that has not waned. The memories of watching Payton bowl over opposing defenses has endured the test of time. An strong argument could be made for Payton to be number one, as he is almost always amongst the 'most watched' auctions on ebays lists every day. An astounding 995 sold listings during the sample months, Elway remains a top seller in all age groups. While the number of cards available on the market may skew these numbers to some degree, the sheer gap of transactions between him and the next players just shows how strong his image is in the market. Of course, his current position with Denver and their notoriety with Peyton Manning at the helm may have put him a bit higher than normal, but he would still make this list regardless. 1. ?????? It might seem like a copout, but since the trading card world has changed so much from the vintage time periods, it is just too tough to choose the Most popular Hall of Famer card of all-time. Soon, the latest wave of Hall of Famers will heavily impact this list. Since so many popular cards are not even present on this list, we leave it up to you to decide who should be number one - someone listed above, or is there a player that we've left off completely that you would place above the rest? 1984 Topps Football #143 Andre Tippett Rookie card PSA 7! New England Patriots! 1984 TOPPS DAN MARINO PASSING LEADERS ROOKIE RC #202 BGS 8 NM-MT 2 9 SUBS PSA 9? 1984 Topps Football #129 Dwight Stephenson Rookie card PSA 8 NmMt Dolphins!